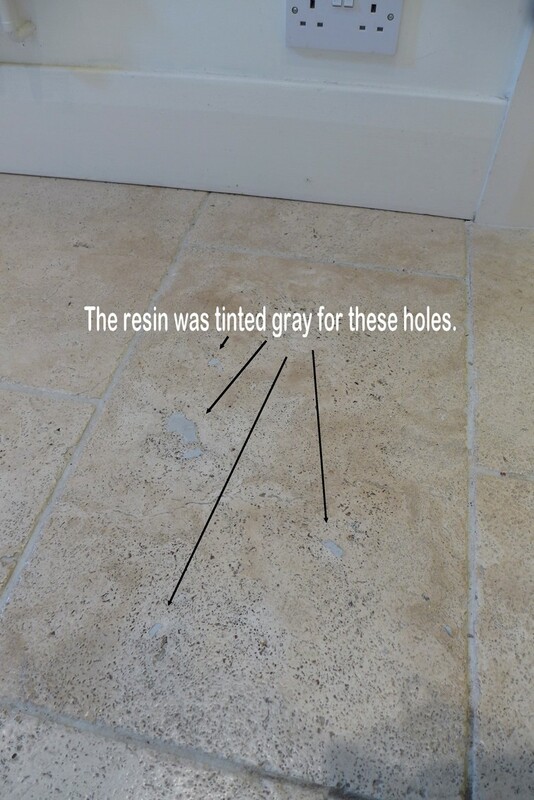 How to fill and repair holes in Travertine & Limestone floors using Tenax epoxy resin filler. 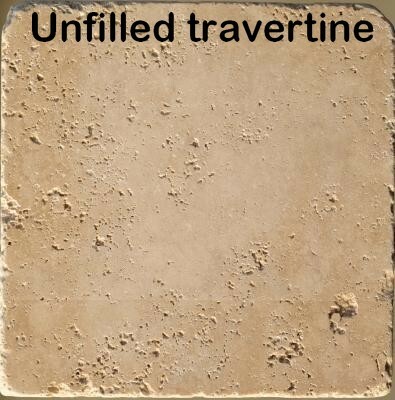 Travertine floor tiles come in both filled and unfilled versions. The unfilled version is where any holes are left open for perhaps a more natural look. The filled version is where larger indentations and holes are filled during production. 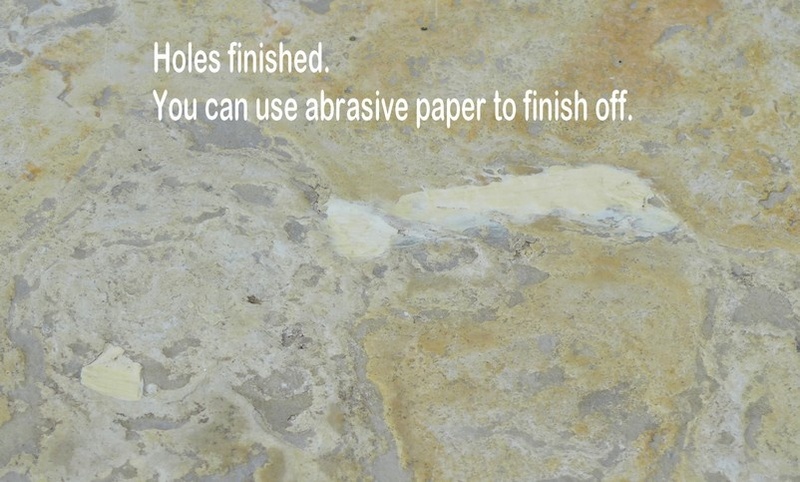 The following article describes how to fill holes in Travertine and Limestone floors. We clean and seal both Travertine and Limestone floors for various clients. One of the main complaints from our customers is that holes have broken through or that some holes are prone to filling with dirt and the floor becomes unsightly. 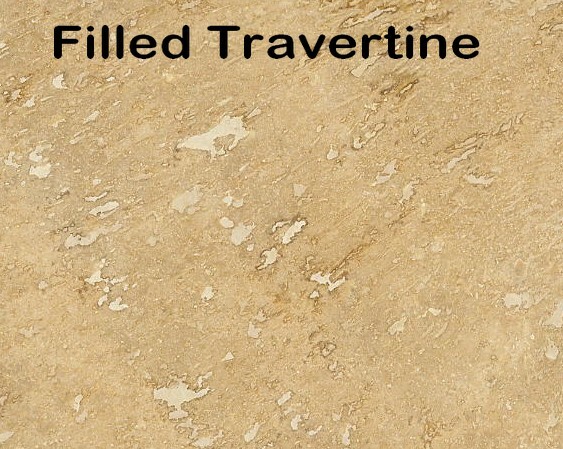 Travertine is naturally filled with small or larger bubbles or holes. Sometimes a pocket or bubble beneath the surface can easily break through due to either furniture pressure or foot traffic. Limestone floors are usually flat or polished while Travertine is usually slightly or more uneven. There are several ways to fill and repair Travertine and Limestone floor tiles. In this article I will describe the best way to permanently repair and fill them. 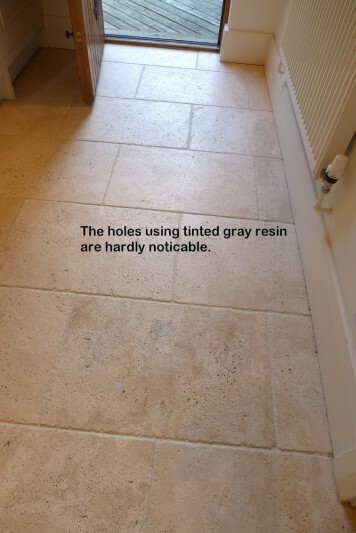 Replacing your Travertine floor tiles if they are damaged can not only be difficult and costly but possibly difficult to match the new tiles with the old. The method on how to fill holes in both Limestone and Travertine floors is just the same although with Limestone which may be a polished flat finish, it may be more desirable to get the filler flush with the surface of the tile. There are various methods to fill holes in Travertine and Limestone. The most permanent method is to use epoxy resin which will set as hard as nails and will not be damaged by traffic or furniture. 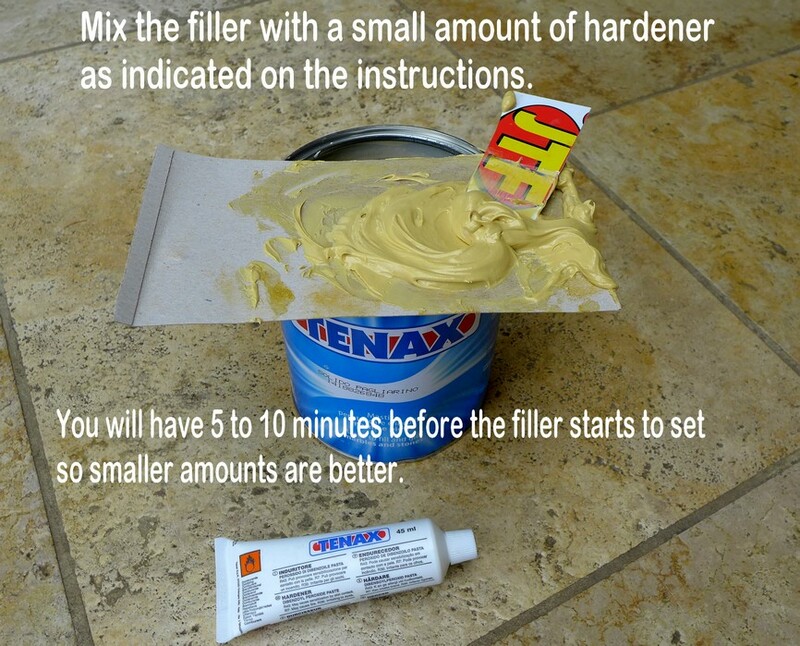 The product we use is Tenax filler which consists of a can of filler and a smaller tube of hardener. First off, ensure the floor is dry as the filler may not adhere to a damp floor. If you are going to seal the floor, leave this till after you have dealt with filling the holes, as the filler may not bond with a newly sealed floor. If the floor is newly sealed it will be best to leave filling for a few weeks when the seal has cured and dried. Epoxy resin floor filler. Acetone to clean the holes (available from chemist or ebay or nail varnish remover). An applicator spreader, an old credit card will do. Some heavy card to mix the filler. 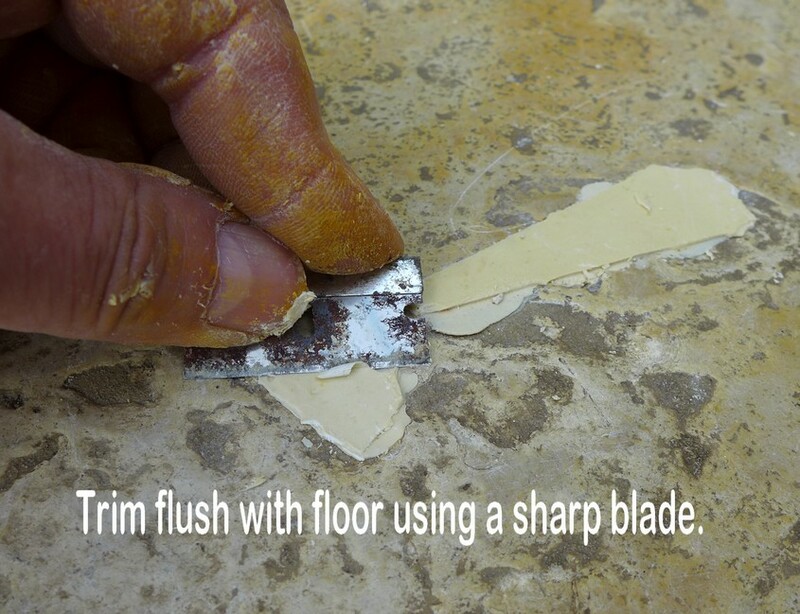 A sharp blade or razor blade to trim flush the filler. Disposable gloves. An old tooth brush ( not your partners). A sharp implement to clean out the holes. Emery paper to sand flat if required. Masking tape. Knee pads or kneeling pad, especially if you have a lot of holes to fill. Tenax colour additive or Dyegrout dye if you need to tint the resin to match the floor colour, I will leave a link below. 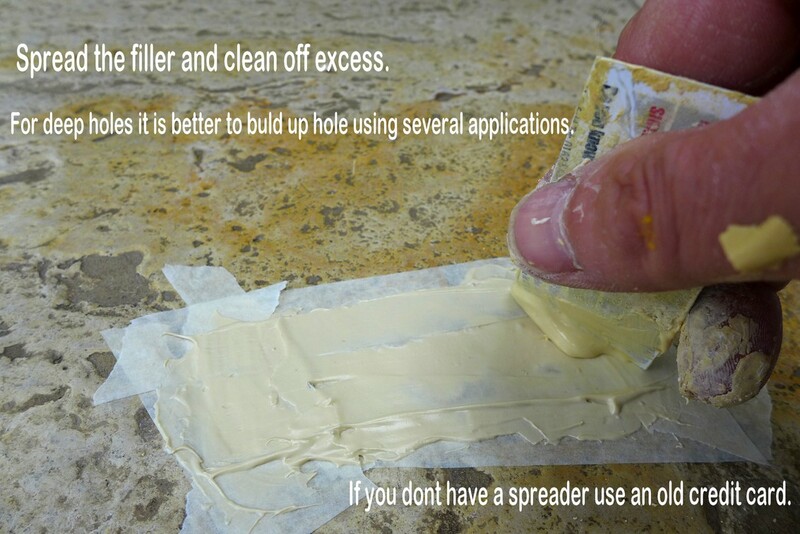 Clean out the holes or damaged area using acetone. 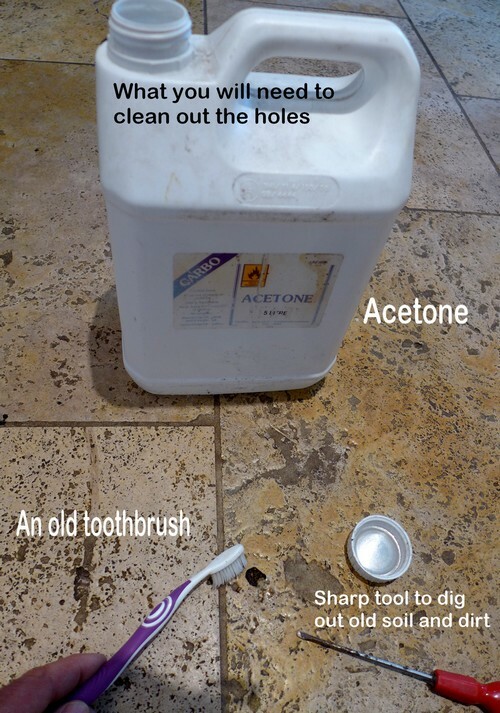 Use the old tooth brush from the cap filled with acetone and a sharp implement or small screw driver. This will dissolve any oil based matter. Vacuum out any dust. Mask off the holes using masking tape. This will protect the surrounding tile. Prepare your filler. Follow the instructions. It says use 3% but that is very hard to guess or even measure. Use a very small amount from the tube…..don’t over do it as it will set eventually. If you use too much it just means you will have to act faster! Alternatively use a small weighing scale to get the exact measurement as per the instructions on the tin. If you measure the right amount it usually sets in 5 to 10 minutes so just use small amounts till you get used to it. Getting the right colour. This resin comes as a straw colour which could match your floor. Travertine floors can come in may different shades. Below we used a colour tint yellow. However sometimes the best results can be achieved using a gray colour which I will come to at the bottom of the page. Spread the filler into the hole in two directions avoiding any bubbles or voids. 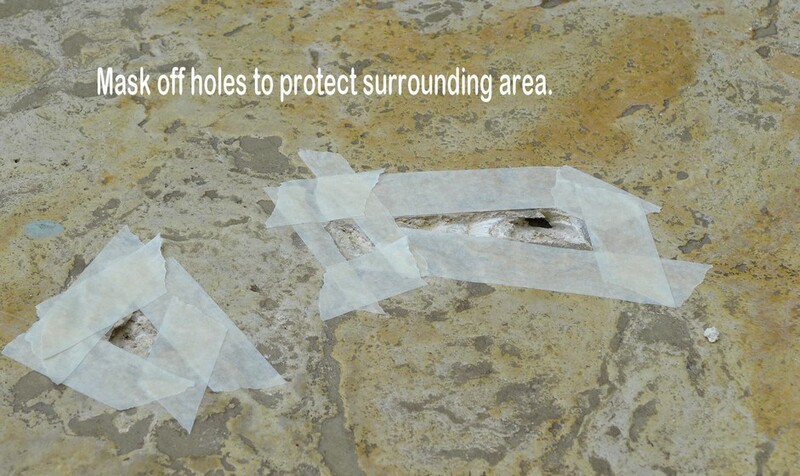 For larger holes in Travertine this may require several applications to build up the filler. 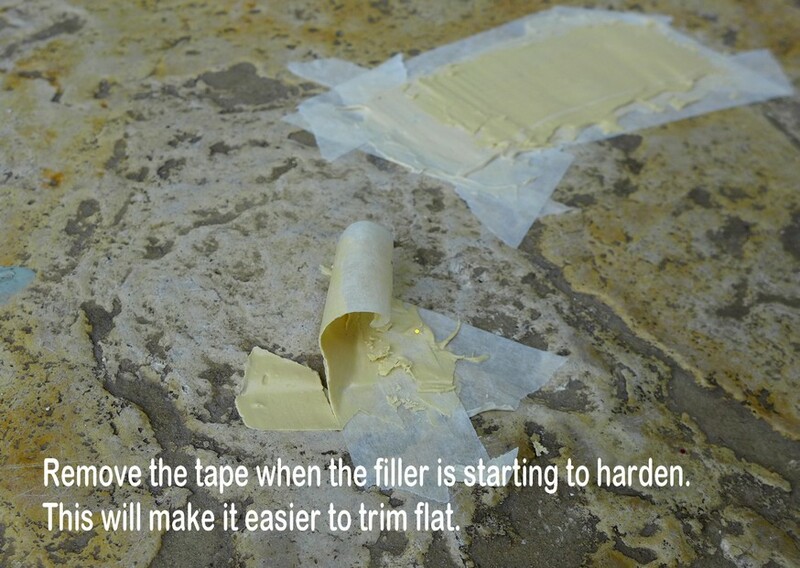 Get as flush as possible but don’t worry if the filler is sitting on top of the tape as it can be trimmed off later. When you notice that the resin is starting to harden, remove the masking tape. At this time the filler will be able to be trimmed easily with a sharp blade. later on you can sand the filler with emery paper to you liking. 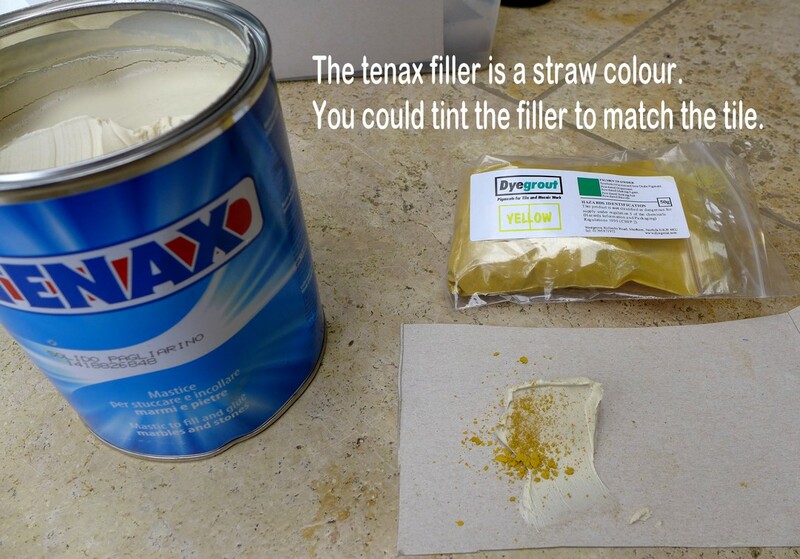 The Tenax epoxy resin comes in a straw colour to fill holes in your Travertine floor. This colour may match your floor and is most likely the best colour for most floors. Tenax do provide their own colouring or tinting to suit variations in floor colour shades. Take a small amount of filler from the tin and hold it next to the tile to see if your happy wth the colour. If you think the colour of the filler is not suitable or stands out too much, you may want to consider adding some colour. When trying a different colour, take a very small amount of colouring and add it gradually to the filler past untill the desired match is achieved. Then add the hardener before filling the hole. I have found that an effective and virtually unnoticeable colour can be gray on some floors. See images below from a Travertine floor filled with gray Tenax Epoxy Resin. 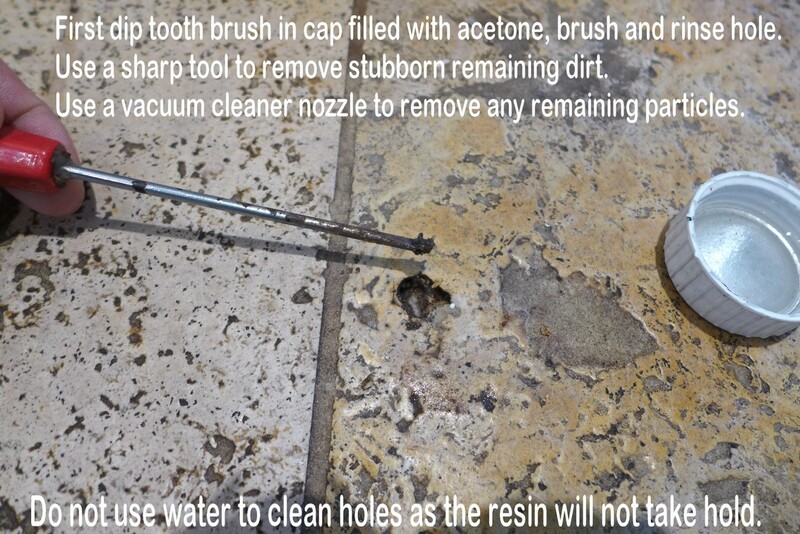 Read more here about Travertine and Limestone floor cleaning. Comments are no longer enabled for this product.